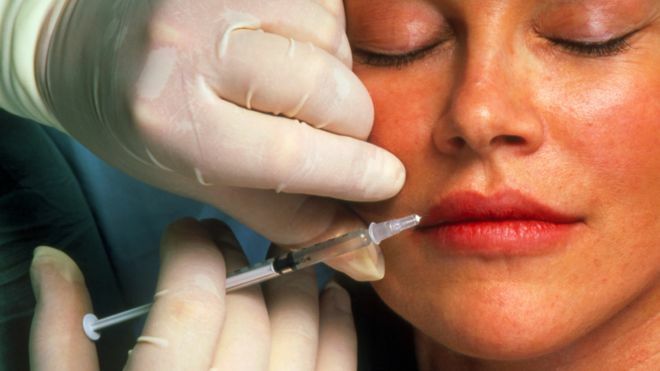 Young people are turning to cosmetic procedures such as botox and dermal fillers as a result of social media pressure, according to a report. A study by the Nuffield Council on Bioethics says government must protect people from an unregulated industry. The report also condemns makeover apps and online plastic surgery games aimed at children as young as nine. The authors fear such apps are contributing to growing anxieties around body image. Much of the cosmetic procedures industry is unregulated so reliable data on its size is hard to come by. In 2015 one market research company estimated the UK market could be worth as much as £3.6bn. But there is little doubt it has grown significantly over the past decade. Prof Jeanette Edwards, from the University of Manchester, who chaired the council’s inquiry into ethical issues surrounding cosmetic procedures, said some of the evidence around games aimed at younger children had surprised the panel. “We’ve been shocked by some of the evidence we’ve seen, including make-over apps and cosmetic surgery ‘games’ that target girls as young as nine. The report describes how apps with names such as “Plastic Surgery Princess”, “Little Skin Doctor” and “Pimp My Face” could be contributing to mental health problems in young people. Prof Edwards also called for cosmetic procedures to be banned for anyone under 18 unless they involve a multi-disciplinary team of specialists, GPs and psychologists. “Under 18s should not be able to just walk in off the street and have a cosmetic procedure. Charlie Massey, chief executive of the General Medical Council, which regulates doctors, said that it had already introduced standards for those performing cosmetic procedures to ensure they work safely and ethically and was developing similar guidelines for surgeons. “Cosmetic interventions are not without risk, and anyone considering a procedure must have confidence that those carrying it out have the necessary skills and competence to do so safely. A government spokesperson also said action had been taken to improve regulation. Kevin Hancock, of the British Association of Aesthetic Plastic Surgeons, whose members helped compile the report, said it “voices many of the same concerns” his organisation has.